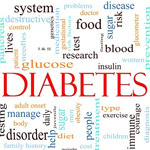 Diabetes : Blood Sugar…what you don’t know can hurt you! By the year 2020, up to half of Americans may be pre-diabetic or diabetic. A major health insurer made that budget-busting projection. Diabetes is already at a crisis level. Chronically high blood sugar (glucose) damages cells, especially those in the arteries, kidneys, nerves and eyes. One study even showed that diabetic men live 7.5 years less than average and women 8.2 fewer years. Many factors play a part in the development of diabetes, but the most obvious cause is the Standard American Diet (SAD). The SAD is “high glycemic”—i.e. it creates damaging spikes in blood sugar. Of course, there are plenty of healthful “low glycemic” foods, but even as a nutritionist, it is harder than you might think to identify and choose them. That’s why I was excited to discover a nutritional supplement that makes average meals behave as though they are low glycemic. The result also helps us lose excess body fat. Often people feel falsely secure if the doctor has not said the words “diabetes” or “pre-diabetes”. However, by the time of diagnosis, damage has already been done. Fortunately, there are early warning signs. Suspect blood sugar issues if you are a woman with a waist larger than 35” or a man whose waist is over 40”. Other signs include: skin tags, carbohydrate cravings and/or feeling headachy, shaky, sweaty, foggy, and/or cranky between meals. High blood sugar contributes to high blood pressure, poor HDL (good) cholesterol, high triglycerides, sleep apnea, polycystic ovaries, gallbladder disease, recurrent infections, gum disease and heartburn (one of my books covers acid reflux in depth). Enough bad news…the good news is that you have control! Blood sugar increases gradually with low glycemic whole foods. That is good. However, when we eat high glycemic foods, they are absorbed rapidly, making our blood sugar jump quickly. That starts an unhealthy chain reaction. Obviously we should eat foods that don't cause blood sugar spikes. The Glycemic Index (GI), an internationally-recognized database, is the most common way to compare the blood sugar effects of foods. It compares how a standard amount of carbohydrate from different foods affects our sugar levels. High numbers are bad. Unfortunately, these ratings are not listed on packages or menus. Even with the internet, it is difficult to determine the rank of a particular food. Guessing isn’t easy either. Packaged foods are especially vexing because the particular variety of an ingredient, proportions and even the cooking method can change the effect. Another measure, “Glycemic Load” (GL) seems more accurate because it takes portion size into account. LOW: many whole fresh fruits, vegetables (except potatoes), beans, nuts, seeds, high fiber cereals, 100% whole grain bread w/out added sugar, oat bran, dairy products and very dark chocolate. MEDIUM: vegetable soup, veggie burger, fruit juices, dried fruits, tropical fruits, grapes, tortillas, whole grain crackers, oatmeal, popcorn and some combination foods like stir-fried vegetables with rice, lasagna and ice cream (the fat slows absorption). HIGH: fast food fish sandwich, hamburger sandwich, pizza, dates, corn, corn chips, some types of rice, rice cakes, most cereals, whole grain pancakes, doughnuts, pretzels, cupcakes, angel food cake and soft drinks. VERY HIGH: canned green pea soup, potatoes, sweet potatoes, fruit leather, most pasta, sweet, sticky and boiled rice, white bread, corn muffins, sugar-sweetened cereals, pancakes from mix, cake, toaster pastries, candy and many sports drinks. It makes sense to eat mostly from the categories that are MEDIUM or lower. But, real life is complex. Some high glycemic foods seem otherwise healthful and we mix many foods in a single meal. Cooking rice, pasta or even veggies until soft makes the glycemic effect worse. Diabetics, especially those on medication, should ask their health professionals if adjustments in their program are needed if they intend to eat low glycemic meals.